A long time ago in Taiwan there was a popular saying, “Being natural is beautiful.” When I first heard of this, I thought it was fairly reasonable. It was only after I had advanced in age and learned some things about Life that I began to see how true and valuable the saying is. For teenagers and adults, being natural is surely better than being innocent. While being natural means you have learned how unnatural the world is and are now endeavoring to embrace Nature, being innocent can be seen as indicating a lack of experience. However, children are born with an innocence that should be cherished and celebrated, while being natural is a goal that one has learned to pursue throughout the process of growing up. Perhaps this is the reason why some teenagers and adults think of children’s books as being too “naive” or “immature”. These books portray the kind of innocence that affords children an imagination that is free of any judgment by mundane values and standards. This can indeed be difficult for teenagers and adults, who often have to concentrate on all aspects of growing up, to understand. Webbster & Button Find a Home is precisely such a portrayal of innocence. In sharp contrast to teenagers and adults who can summarize the story in one sentence — “Having been abandoned by their owner, a puppy and a kitten need to learn how to survive in the natural world” — this book provides an opportunity for children to imagine a million exciting and wonderful episodes for the two little guys as they set out on their first adventure. 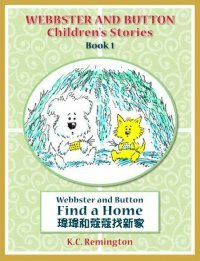 Webbster & Button Find a Home is the first of American writer and illustrator K.C. Remington’s “Webbster & Button Children’s Stories”, a series that now boasts 20 amazing books. Dr John Cech, professor of children’s literature at the University of Florida and author of Angels and Wild Things: The Archetypal Poetics of Maurice Sendak, called them “warm and wonderful stories”. Such warmth shows in his writing, which is simple and honest. It is also evident in his cartoons, which are relaxed but amazingly graceful. If teenagers and adults try very hard, they can find plenty of lessons from these children’s stories, such as the importance of looking after one’s pets, of being strong and never giving up, and of “God helps those who help themselves”. However, for children, these stories are simply tales of that innocent world that is occupied by little puppies and kittens. In this world, the two little characters can cry or laugh as much as they want to. There is also a huge family of crows that are absolutely noisy but relentlessly happy. As readers see how Webbster and Button just sit there munching on corncobs and tossing out one after another empty corncob out of their little shelter, they cannot help but smile. Why? Because there is simply nothing complex about corncobs! Teenagers and adults, who have experienced the complexity of growing up, observe and experience their lives; but children only live with an innocence. While both are nice, having seen so much exquisitely designed and luxuriously displayed jewelry, one tends to specifically appreciate an unpolished gem.